In the NFL, another coaching vacancy has been filled. The Minnesota Vikings parted ways with Leslie Frazier and hired Cincinnati Bengals defensive coordinator Mike Zimmer to run the ship. Zimmer has an excellent reputation as a defensive specialist, and even gained some celebrity with his multiple appearances on HBO’s Hard Knocks show. Zimmer is very liked by players, and should be able to do some interesting things in Minnesota. In other NFL coaching news, the New York Jets have decided to stick with their man Rex Ryan. Ryan had two pretty bad seasons with the Jets, but it looks like they’re chalking it up to too many injuries and not the right player personnel. After all, Ryan did turn around the Jets organization, and they’re banking on him continuing to stay relevant. Is Geno Smith the answer at starting quarterback? Probably not, but at least Ryan won’t have to worry about his job, and can make the right decisions next season — not ones he think will please ownership. Finally, if you watched the Denver/San Diego game last Sunday, the only word that comes to mind is “Omaha!”. Peyton Manning yelled it so many times at the line of scrimmage that it became the catch phrase of the game. Now 5 companies in the Omaha area are hoping to exploit this in a good way. 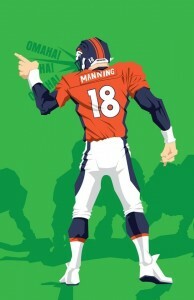 They said that everytime Manning yells “Omaha!”, they will donate $500 to charity. Hopefully Manning doesn’t change his “Omaha” call at the line to something else… say “Lincoln”?